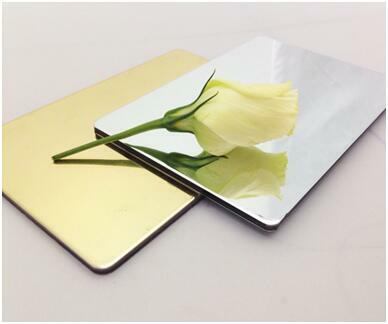 Product categories of Mirror Aluminum Composite Panel, we are specialized manufacturers from China, Silver Mirror ACP, Golden Mirror ACP suppliers/factory, wholesale high-quality products of Mirror ACP R & D and manufacturing, we have the perfect after-sales service and technical support. Look forward to your cooperation! Mirror Finished Aluminum Composite Panel is made up of three layers, with two layers of aluminum skin on the top and bottom, and one layer of anti-toxic polyethylene material in the middle. For the front side of the mirror finished aluminum Composite Panel is treated like a mirror. The Mirror composite panel looks more beautiful and widely used in interior decoration, kitchen, especially in ceiling and household appliance and furniture etc.